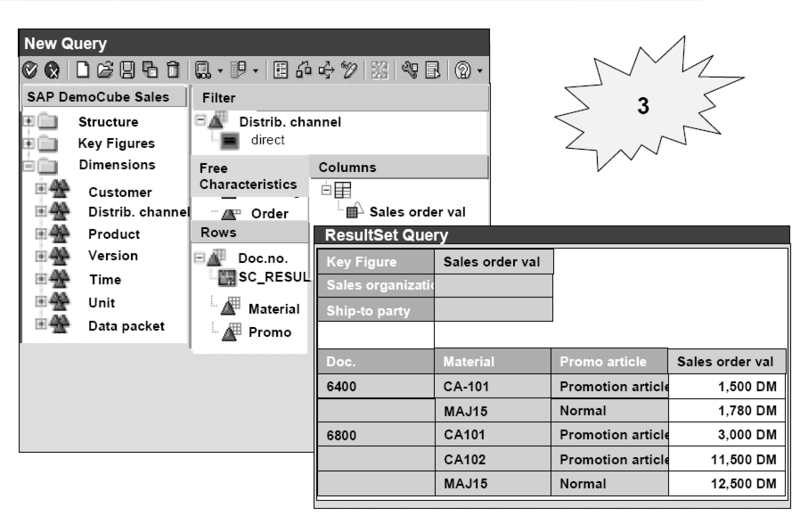 SAP Business Warehouse Complex Reporting helps in the scenario likeyour company requires additional reporting functions, to enable it to solve specific problems.You want to use a query result as a filter for a second query, use the report/report interface to drill-through from either one query to another or into the R/3 OLTP system, and use the InfoSet Query functions to report on master data. filter in the ResultsSet query. In the maintenance screen for variables, you set the pre-query as a variable. The variable is added to the ResultSet query. The characteristic that you restricted using the variables, now contains the filter settings from the pre-query. Data analyzed in a Business Information Warehouse, is usually data that has been condensed to give you an effective overview. In some cases, however, you want to look at line items on a document level. The overview aspect is still the main aim of the data analysis, but the option of looking at data in more detail, is also important, and must be available at all times. Using the report/report interface, you are able to combine sections of several different reports. This allows you to to report flexibly online. The report/report interface (R/RI) is the tool that you use to drill-through reports. The R/RI interprets the update rules of the individual fields. Before you use the R/RI to drill-through into an R/3 source system, you have to maintain the update rules and all the objects that are used to load and homogenize the data: DataSource, InfoSource (transfer structure, transfer rules, communication structure). This allows the field names in BW to be assigned to the corresponding field names in the R/3 system. Before you start the drill-through, you have to determine a Sender (BEx query) and Receiver, and assign them to each other. To do this, go to the Query Jump Targets menu. 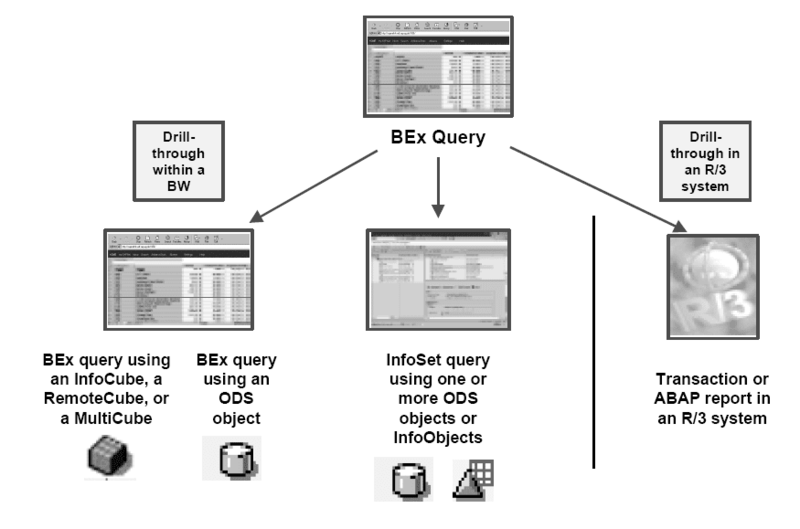 Navigating in BW to a BEx query, using an InfoCube, a RemonteCube, a MultiCube, or an ODS object. 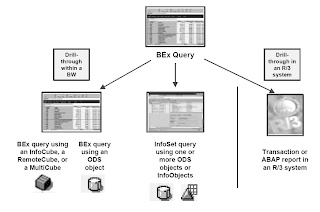 Navigating in a BW to an InfoSet Query, using one or more ODS objects or InfoObjects. Navigating in an R/3 system to a transaction, an ABAP report, a report-writer report, a recherche, or a report portfolio. 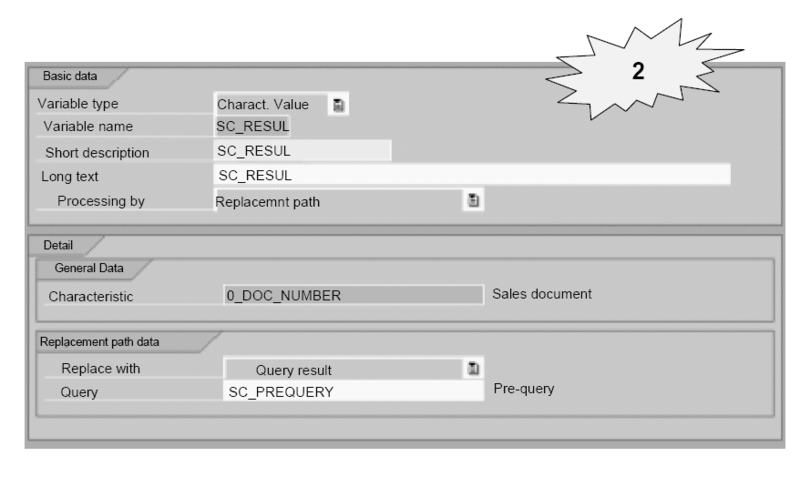 You can also drill-through to BEx queries and InfoSet Queries from a second BW system, that is connected as a data mart. With the R/RI, a cascading jump sequence is also an option. 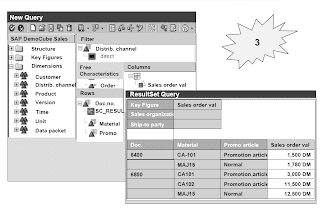 This means that, by arranging carefully the sequence of Senders and Receivers, you are able to jump from a query with aggregated data (for example, from an InfoCube) to a query with detailed data (for example, an ODS object) and from there into the R/3 system (document level of detail). In this way, you get to more and more detailed information about a characteristic value. To drill-through from one BEx query to another BEx query, you have to designate one of these queries as the Sender and the other as the Receiver. 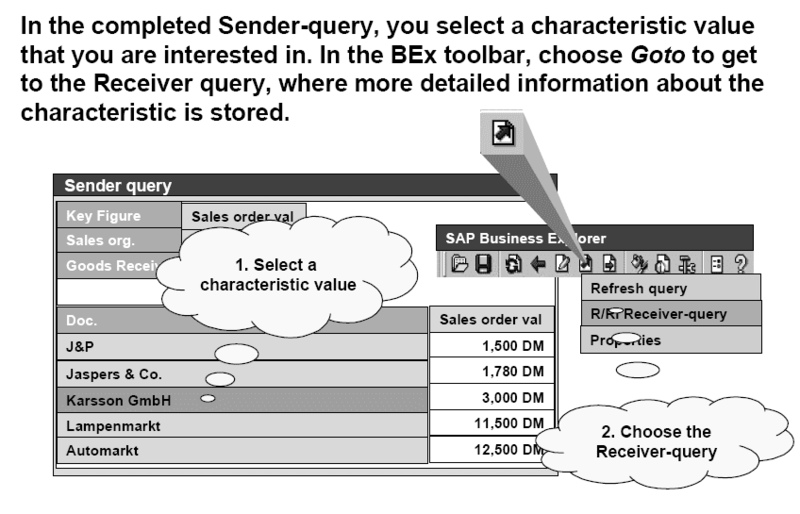 You maintain the Sender - Receiver assignment in the Query Jump Targets menu (SAP Easy Access Menu/Business Explorer/Query Jump Targets). In the Sender field, specify the name of the query from which you want to start the drill-through (1). Important: Specify the technical name of the InfoCube that the query belongs to first, and then the technical name of the query (separate the two names with a forward slash). It is best to use the F4 Help. Choose the Create button (2). 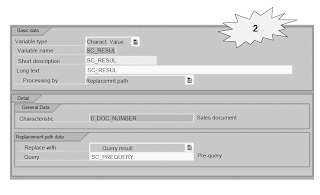 In the dialog box that appears, select BEx Query as the report type. In the next window, specify the technical name of the InfoCube and the query that you want to use as the Receiver (3) - use the F4 Help. Confirm your entries. The query you chose is displayed in the list of Receivers (4). 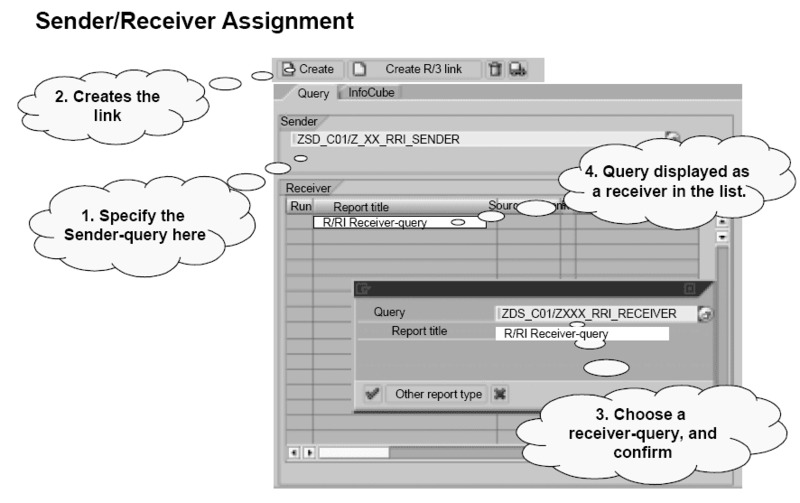 Save your Sender - Receiver assignment. In the Business Explorer Analyzer, open the Sender-query to prepare to start the drill-through. 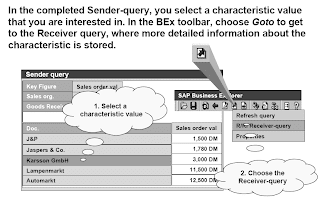 On the worksheet, you position your cursor over the cell containing the value for which you want to see more information, specifically the detailed information that is stored in the Receiver-query (1).Choose Goto from the BEx Analyzer toolbar. The jump targets you assigned are displayed in the context menu. 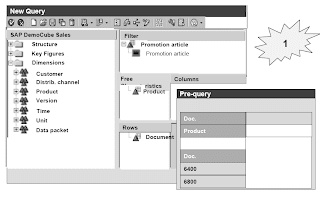 Click with the mouse-button once on the Receiver-query (2). 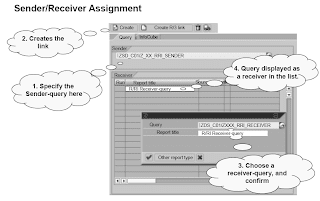 The Receiver-query is displayed in a new workbook - the value of the cell over which you positioned your cursor in the Sender-query, is used as a filter value in the Receiver query. 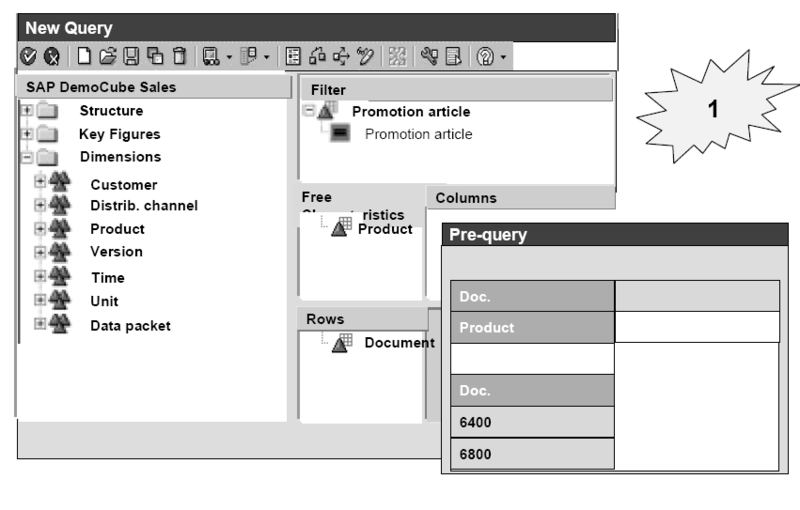 This means that only the values that you require from the Receiver-query are displayed.